Learn more about each of the actions you can use to build a bot conversation. 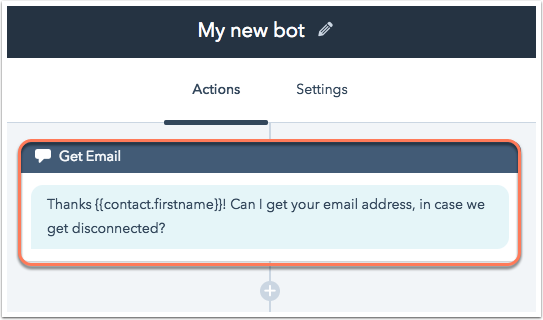 You can also customize each bot action using conditional logic to create a more interactive experience for your website visitors. Hover over the bot you want to modify and click Edit, or click Create chatflow to build a new bot. Click the plus icon + to add new actions to your bot. Use this action to create a new message for your bot conversations. You can collect data to populate specific contact properties. Nickname: enter a nickname for this bot message. Message: enter the content for your bot message. You can use personalization to pull in details from the contact record of a known visitor. + Add message bubble: if you want multiple message bubbles to pop up as part of this bot message, you can add another bubble here. Attach a file to this action: click the Choose a file dropdown menu, and either upload a new file or select an existing file to send to visitors. Collect user input: use this checkbox to indicate that the bot should wait for a response before moving onto the next bot message. The first message in any bot sequence will have this option selected by default. Save to HubSpot property: click the dropdown menu and select a contact property. The visitor's response will be added as the property value on their contact record. Skip this action if property already exists: use this checkbox to skip this action if the visitor's contact record already has this property filled out. Quick replies: add answers that your visitor can select as responses to your message prompt. To add quick replies, start typing your copy and press Enter to save each one. Disable free text input: use this option if you want to limit visitors to selecting among your pre-set options in Quick replies. Use this action to capture a visitor's consent to communicate. Nickname: enter a nickname for this request. Message: enter content for the bot message. You can use personalization to pull in information from a known visitor's contact record. + Add message bubble: if you want multiple message bubbles to pop up as part of this bot action, you can add another bubble here. Show legitimate interest privacy text: select the checkbox if you want to let visitors know what type of communication they're opting into and how you will communicate with them moving forward. The default language set in your account settings will display with this option selected. Subscription: click the dropdown menu and select the subscription types these contacts will be opting into. If user subscribes, show message: enter the text that will display if a visitor subscribes. If user doesn't subscribe, show message: enter the text that will display if the visitor does not subscribe. Use this action to set a contact property to a specific value based on the replies of your website visitor. Nickname: enter a nickname for this contact property value action. Contact property: select any contact property from the dropdown menu. New property value: enter the value you want to populate on the contact record. You can customize how this populates based on the conditions set in the If/then branches tab. Company property: select any company property from the dropdown menu. 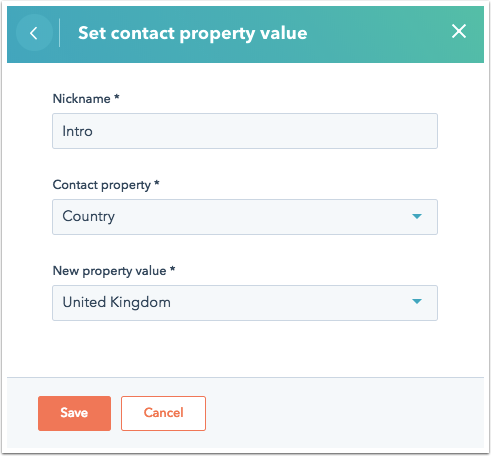 New property value: enter the value you want to populate on the contact's associated company record. You can customize how this populates based on the conditions set in the If/then branches tab. Use this action to add the contact your bot is chatting with to a static list. If a contact record does not exist for the visitor, this action will be skipped. Nickname: enter a nickname for this list action. Static list: select an existing static list from the dropdown menu. Use this action to create a new ticket for this contact. If an associated contact record for your website visitor does not exist, this action will be skipped. Nickname: enter a nickname for this create ticket action. Ticket name: enter a name for the ticket. Ticket pipeline: use the dropdown menu to associate the ticket with a specific pipeline. Ticket status: use the dropdown menu to assign a status to the ticket. Ticket description: use the dropdown menu to indicate whether you want to set your own description for this ticket. You can select Prompt the visitor for ticket description to invite the visitor to provide a summary of the issue for the ticket description. Ticket priority: set the ticket priority as either High or Low. 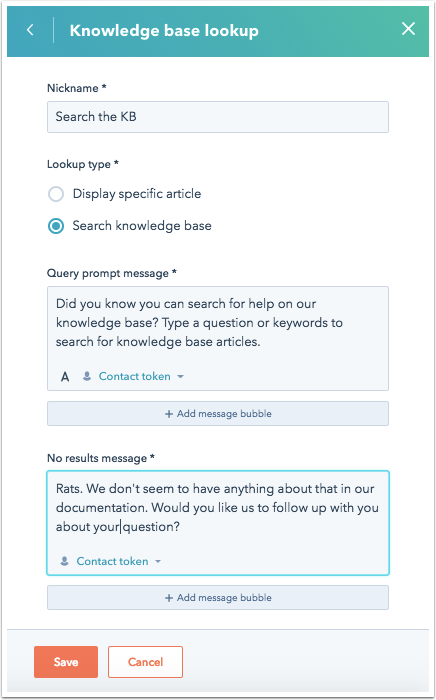 Use this action to surface a specific knowledge base article to your visitor, or prompt them to search your knowledge base to find the article they need. Nickname: enter a nickname for this knowledge base lookup action. Display specific article: select this option if you want to surface a specific article for your visitors at this point in your conversation. Article to display: use the dropdown menu to select a specific article you've published on your knowledge base. Search knowledge base: select this option to invite your website visitor to search your knowledge base. Query prompt message: enter a bot message to prompt your website visitor to search your knowledge base. You can use personalization to pull in details from the contact record of a known visitor. No results message: enter a bot message to return to your visitor if there are no results for their search query on your knowledge base. You can use personalization to pull in details from the contact record of a known visitor. Use logic to hand off a conversation with a lead to a specific user or team based on their availability to chat. This action is only available to users with Admin access. Nickname: enter a nickname for this set of handoff rules. Automatically assign to: use the dropdown menu to determine to whom the incoming thread should be routed. 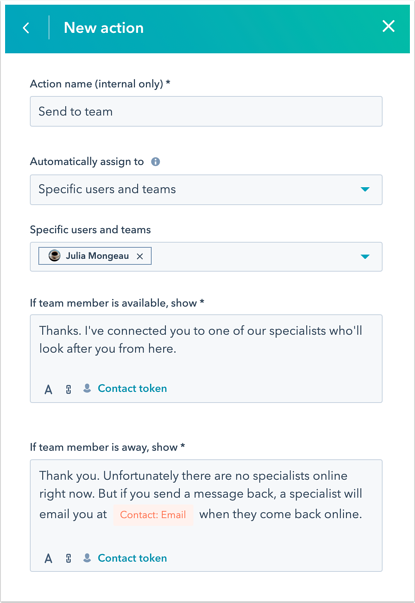 If team members is available, show: enter a specific message to display when your user(s) or team(s) are available. Please note: you can only handoff a chat conversation to users who have a paid Sales Hub or Service Hub seat. If team members are offline, show: enter a specific message to display if no one is available to chat. If unassigned, show: enter a specific message to display when the message is received but hasn't been assigned to a specific user yet. Use this action to enroll the contact you're chatting with in a specific workflow. If a contact record doesn't exist for the visitor you're chatting with, this action will be skipped. Nickname: enter a nickname for this workflow action. Workflow: user the dropdown menu to choose which active workflow contacts should be enrolled in. Use this action to trigger a webhook request. Learn more about triggering a webhook with bots. Nickname: enter a nickname for this action. Webhook URL: enter the endpoint URL for the webhook. Wait for webhook feedback: select the checkbox if you want to wait for the webhook to return information before moving to the next action. Error message: enter text for the error message. Use this action to run a code snippet at a step in the bot conversation flow. Snippet description: enter a description of the code snippet. Runtime: the default template for Node.js 6.10 is included in the code snippet editor. Click Open in full page editor to make edits in another window. 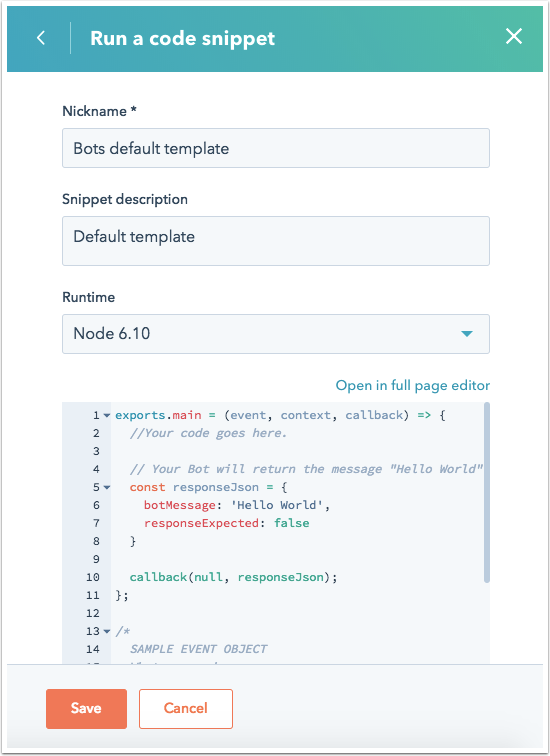 Learn more about running code snippets in bots. Use this action to share a round robin or group meetings link through a bot message. Meetings link (round robin or group): use the dropdown menu to select an existing meetings link. If you don't have a round robin or group meetings link set up, create a new link here. Successful booking message: enter a message to display when a visitor successfully books a meeting with your team. The meeting link used in the bot action does not include any fields other than first name, last name, and email. First name, last name, and email are collected before the meeting action is reached in the bot flow. The meeting link has times available in the near future. The meeting link's Privacy and consent (GDPR) switch is toggled off. After you've made your selections for your bot action, click Save. If/then branches decide the flow of your bot's conversation. 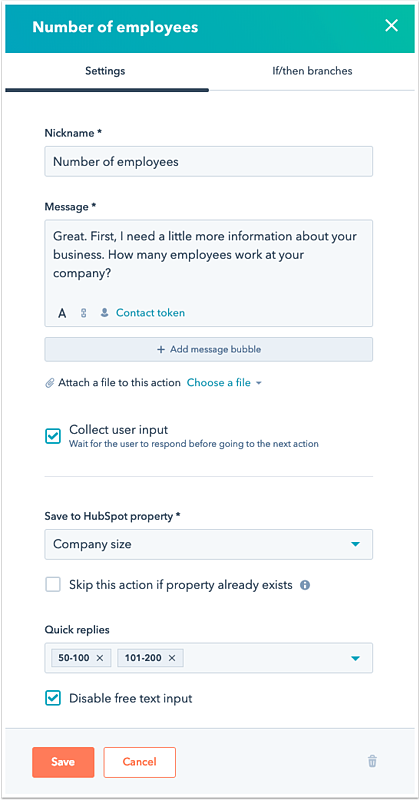 You can add conditions to tell your bot to skip to a specific action in your flow based on the visitor's response or contact property values on their record. In the bot editor, click the action you want to modify. Use the dropdown menu to indicate which action should come next if no conditions are met for this action. 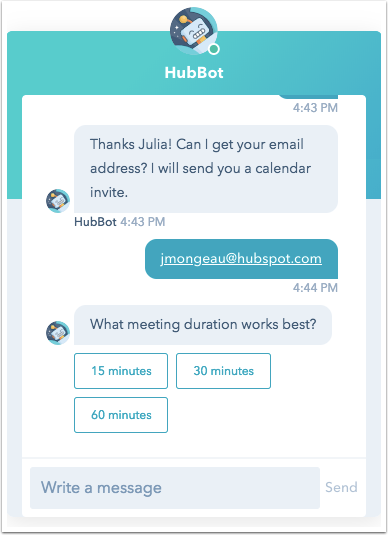 Please note: Sales Hub Starter, Service Hub Starter, Marketing Hub Starter, and free users cannot add custom conditions to their bot's conversation flow. Click Add if/then branch to set up rules for how the conversation flows from this action. Use the first dropdown menu to select whether the condition is based on the user's response or a contact property on their record. Use the next dropdown menu to apply logic to values you're looking for. Type in any value you want to create unique conditions for, then press enter to add it to your list. If there are Quick replies available for this bot action, they'll be available in the dropdown menu here. Click AND to create additional rules for your conditions. Use the dropdown menu to select which action your bot should perform next if any of conditions defined here are met. After selecting all of your conditions, click Save.